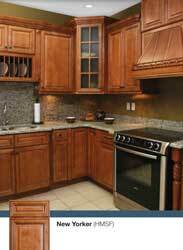 So, you're ready to renovate your kitchen with some brand new cabinets? Before you can start choosing the new cabinetry, it's important to gather the exact measurements of your space. You don't have to be a contractor to draw up the proper measurements for your kitchen, but you do need to take care and get it done the right way. As the old saying goes, "Measure twice and cut once." The proper measurements help your kitchen remodeling go smoothly, while the wrong measurements set you up for disaster. Always take your measurements in inches. Draw your kitchen on a piece of large paper; this will serve as the map for your project. The map doesn't need to be exactly to scale, but use a ruler to ensure straight lines and stay true to the shape -- for example, if your kitchen is not a perfect square, don't draw it that way. It's also good to come up with some sort of guideline. For example, perhaps one inch on the paper will equal 2 feet. Once you have the outline complete, measure each of the walls and note the length on your map. Start measuring at the door, and work clockwise around the room. In addition to capturing the measurement for the entire wall, you should also measure any breaks. For instance, if there is a window or door on one wall, you should measure the door or window as well as the exact measurement of the wall on either side. Draw and label these breaks on your map. Corner measurements are also very important because your cabinets will need to fit snugly into these spaces. For a corner measurement, you are not measuring length, but rather the angle at which the two walls meet. If you currently have cabinetry in the corners, this measurement may not be possible, but take it whenever you can. Often you can use the space underneath the cabinet, just above the counter. Get a carpenter's framing square and place it in the corner. Note on your drawing if the corner is an exact 90 degrees (which is ideal), or whatever the degree is at which the walls meet. You also need to measure the vertical length of your walls, or the measurement from floor to ceiling. Just in case your room is not entirely level, you should take this measurement in several different places. Make sure you mark on your map the places in the where you took the measurement. Kitchen remodeling projects often include an upgrade in appliances, so you should also note on your map where the appliances need to go. If you have appliances picked out, measure the floor model in the store and add the measurement to your kitchen map. If you don't yet have appliances selected, at least measure the space where the appliances currently sit and mark it on the map. Sometimes cabinets are placed above a refrigerator or window. If you are planning to place cabinetry in those locations, you also need determine the number of inches from the top of your window sill to the ceiling, or the top of your fridge to the ceiling. Also measure how many feet out from the wall the cabinetry can comfortably fit, leaving you enough room to get around with ease. Kitchen remodeling doesn't have to be painful, but it can be if you start the project out on the wrong foot. Accurate measurements help you choose cabinets that will fit precisely, or aid your designer in constructing them in the correct dimensions when you are getting custom cabinetry work done. anung meron bakit about kitchen ang mga nababasa ko ngaun.. anyway..
sabi nga nila before u do anything else u need to do it on the scratch para may outlibne ka sa pag gawa... tama yung mga tips na ito..
we had our cabinets done by our carpenters, expensive kc pag galing sa furniture store then minsan manipis pa ung materials used kung mura ung bibilin..
Measure twice and cut once + taking measurements in inches are things I am taking note of. Thanks. Thanks for sharing this. I have been looking for a very good kitchen design for almost a month now. We are actually renovating our house now. Thanks!! We have our kitchen measured and designed by hubby...went to one of the reliable kitchen makers (would love to have ikea but we settled for Kika) and had them installed...finished in half a day! I would love my mom's kitchen fitted like ours! thanks for the tips! It is best to make a blueprint first before the work is done. Great tips... I know nothing about this until you explain the details.